This sweater is one of my favorites. Being cashmere, it's super soft and then there's the added bonus of the really cool emerald snakeskin print! Even though the color and print are bold, this is such a great basic piece and one that I wear a LOT during the colder months. I topped this outfit with my super cozy faux fur vest, I wore it to a family brunch and everyone was making fun of me saying I looked like a dog. But that could also have something to do with how I was crouched on the ground next to my own dog. I love that snakeskin top of yours - the print is so cool and I really enjoy that brilliant emerald shade. 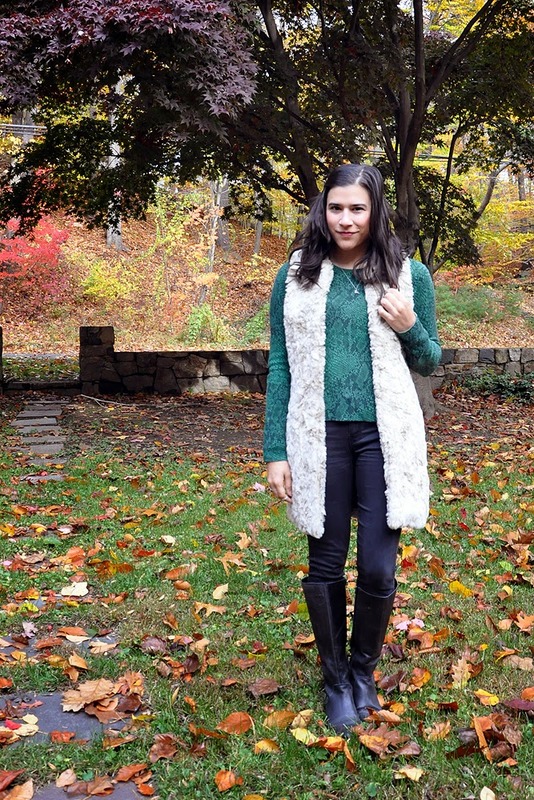 Oh the furry vest is a great piece ! Okay I need that vest! How cozy. I think the vest is great and you don't look like a dog! I love the color and length! Haha, I don't think you look like a dog at all, even though I suppose the color and texture of the vest kind of resembles that of Chloe. But you are wearing snake print and they didn't say you looked like a snake, so really, they were just being silly. Love that sweater by the way. Perfect color and clearly cashmere can't be beat! Love the vest. The length is perfect!